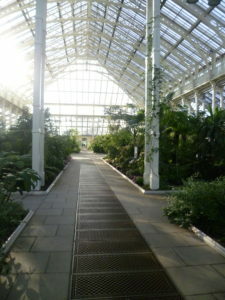 The Temperate House had been seriously at risk for years, due to corrosion, rotting timber, and previous restoration work done on the cheap; and it has just opened again after a five year, forty-one million pound restoration. Before the restoration, it was a dark, rather gloomy place; trees brushed against the roof and crowded out the light, so that few plants grew on the ground. Now, the over-tall trees have either been pruned back or replaced by something smaller and, subsequently, the planting underneath has sprung up with renewed vigour. Apart from a very few trees which couldn’t be removed during the restoration, almost every single plant was dug up and housed elsewhere for the duration, and Decimus Burton’s original 1863 building, was completely stripped back to its bones. The restoration site team were all given tablets with coding software so that each item removed, whether stone, metal, wood, could be registered and its original location meticulously noted. The metalwork was cleaned with high pressure water jets and blasted with crushed garnets to remove any corrosion, which was so thorough that it even revealed the original casting marks. Each piece of metal, stone and timber was then repaired, restored and repainted, and finally replaced in its original position. 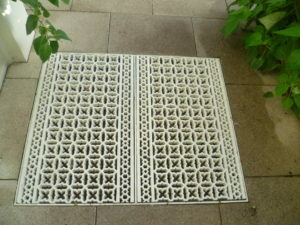 One of the original cast iron grilles for the Victorian underfloor heating. 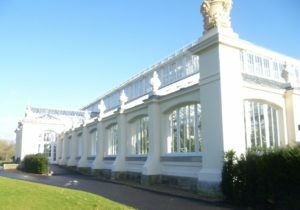 Cranes removed the hundred and sixteen Coade stone urns on the roof, some of which were chimneys pretending to be Classical urns which once extracted the smoke from the Victorian heating system underneath the floor of the glasshouse. The 15,000 panes of glass in the roof were completely replaced with modern state of the art glass panes which control temperature and humidity as well as light. 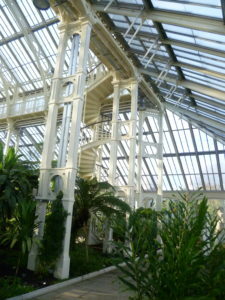 The largest glasshouse has two spiral staircases, in diagonal corners, leading to a high walk all round the glasshouse so that you can have an eagle’s eye view of the whole area. My friend doesn’t like heights, which is a pity because the view is spectacular, and the railings are at elbow height so you feel quite safe. Looking down at the four sections of planting and the central paved diamond. 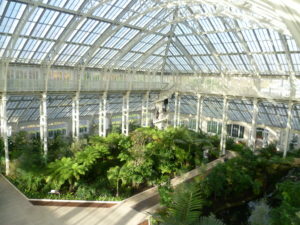 The glasshouse is rectangular and the central area is divided by paths into four large beds with a diamond-shaped stone-lined space in the centre. 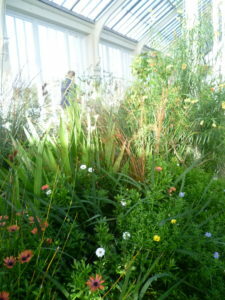 These four central rectangular beds grow plants from Australia, New Zealand, and two beds have plants from the Americas. 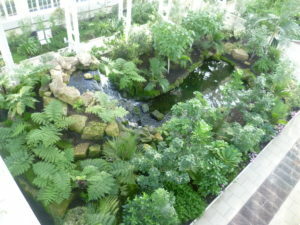 There is a path round the edge of the glasshouse with border beds from the Himalayas and various islands. 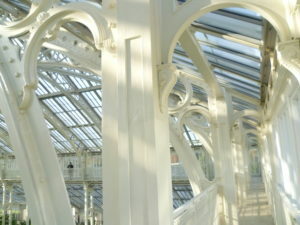 The cast iron pillars support wrought iron ribs which hold up the roof. Visually, it looks wonderful; a cross between a fairyland railway station and a light and airy cathedral. In fact, when I climbed up, all I wanted to do was gaze at the ceiling – never mind the planting! The planting below is not particularly exciting at this time of year – it’s mainly a mass of green. The plants all come from the temperate zones, as I’ve said: the Mediterranean, Africa (but not from equatorial areas); south and central America; Asia; Australia (though not the deserts), and New Zealand and various islands. I particularly enjoyed looking down on the New Zealand section which has a small lake and you could hear, but not see, a waterfall somewhere below. 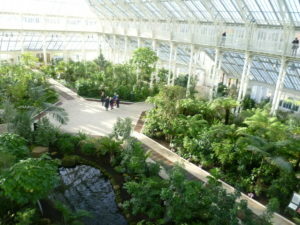 After seeing the glasshouse from on high, I re-joined my friend and we walked round at ground level. I was particularly taken with the cirr pine from the Himalayas. An information board told us that it had very long needles because its habitat is prone to bush fires. The needles’ length means that the tips catch fire first and, rather like a match, the fire tends to go out before it’s had a chance to climb the whole length of the needle, which saves the actual stem from burning. The plant itself is left unharmed. Nature can be very ingenious. At the end of the glasshouse you come to the Weston Octagon, a small octagonal glasshouse, designed in a completely different key, much smaller and more intimate. 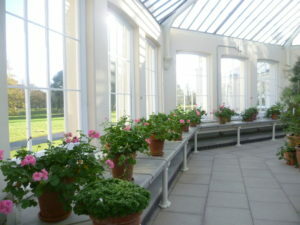 It has a beautiful display of geraniums in front of the bowed window, each in its own Kew Garden terracotta pot. I liked the fact that the evidence for work behind the scenes, isn’t hidden. 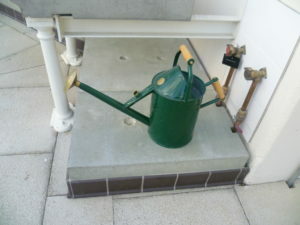 There is a yellow coil of plastic piping in one corner for watering the plants, for example. It adds a welcome splash of colour. On the far side of the Weston Octagon is another, slightly smaller and plainer glasshouse with a long central stretch of paving and no high walk. This is a calmer, less busy space. 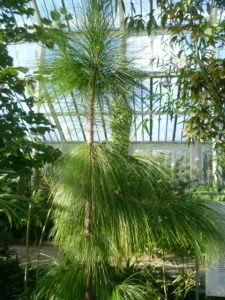 The plants here are all from South Africa, a fact probably explained by the number of 18th century collectors who went there on collecting expeditions at the instigation of Sir Joseph Banks, garden adviser to King George III and unofficial director of the Botanic Garden which was then part of the royal Kew estate. 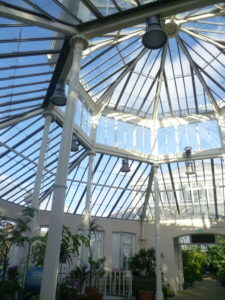 There are actually quite a lot of flowers out in this glasshouse, which was good to see. A couple of gardeners were busy trimming and tidying. 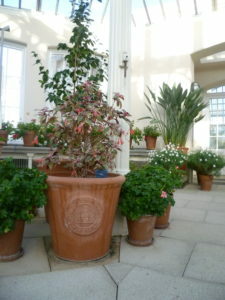 Had I visited the Temperance House in the spring when all the spring flowers were out, doubtless I would have felt differently, but at the end of November, when plants were settling down for the winter, my attention was caught far more by Decimus Burton’s architectural achievements, than by the plants on show. Forty-one millions pounds is a lot of money, but, in my view it has been worth every penny. Not only is the Temperate House a spectacular and beautiful space; it is also now fully equipped to play its part in the vital work of saving endangered species in the difficult times for our planet which lie ahead. What an amazing place. Looking all spanking new like this you can really see how magnificent it must have been when first built. 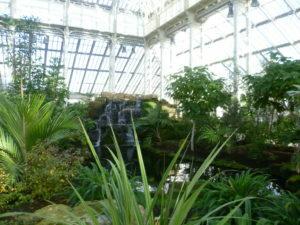 Wasn’t the Crystal Palace a pretty huge glasshouse too? Thank you for your comment, Elizabeth. 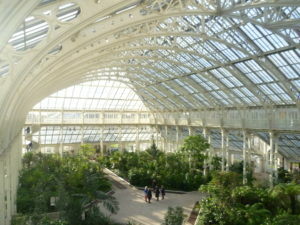 Yes, the Crystal Palace was huge, probably much bigger than the Temperate House, but, of course, it was designed for people and exhibits rather than plants. I’d have loved to have seen it. My mother remembered watching it burn down in 1936 – it must have been an awe-inspiring sight. That’s glorious! A real chance to imagine how the first visitors must have felt on walking into the then, brand-new innovative glasshouse. Thank you for your comment, Jan. I agree, I’d loved to have been at the opening of the Temperance House in 1862. But, although it was innovative in a number of ways, don’t forget that the people there at the opening would certainly have remembered Joseph Paxton’s spectacular Crystal Palace at the Great Exhibition in Hyde Park in 1851. And of course Paxton himself was a gardener, having built the glass succession houses for fruit growing at Chatsworth for the Duke of Devonshire. 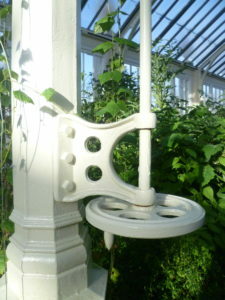 They were the forerunners of the revolutionary design that he submitted for the Crystal Palace. You are right, Pauline – thank you for contributing to the conversation. The architect Decimus Burton seems to have had his fingers in an lot of different pies; he also designed Kew’s Palm House; the Elephant House at London Zoo; the lay out of Hyde Park; Charing Cross Hospital, chunks of the classy Carlton Terrace and the Athenaeum. And that’s just for starters. What a wonderful structure it looks, Elizabeth! Thank you very much for your guided tour of this glorious building. Your description of the moving of each part of the structure, with careful annotation, and then its replacement, reminded me of the removal of every stone of several Epyptian temples prior to the creation of Lake Nasser, although in that case they were placed elsewhere, but in exactly the same relationship to the sun. Thank you for your comment, Liz. I knew about the removal of the Egyptian temples prior to the creation of Lake Nasser but I didn’t know that they were placed in exactly the same relationship to the sun. The temples’ relationship to the sun was was obviously of immense importance to the Ancient Egyptians and I’m very pleased to hear that that was respected. 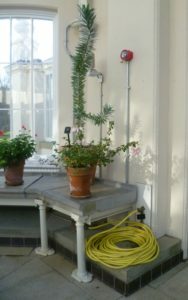 It sounds as though the dismantling of the 69,000 individual elements of the Temperate House was carried out with equal meticulousness.